They say that profits are made at time of buying and not selling. Now suppose you have shortlisted companies, whose shares you want to buy, i.e. you have a Ready-2-Buy-List with you. (Check our favorite ones here). So would you buy these stocks at any given price or would wait to buy at prices, which are low, atleast by some standards? We assume you belong to the small minority (fortunately) which believes that it is wiser to adhere to some set valuation standards. Though not widely used in Indian markets and having its own sets of shortcomings, we decided to use Graham’s Number as the standard to evaluate our favorite stocks. But before we share details of Graham’s Number for chosen Indian companies, we would request you to read this article. The article highlights the dangers of using just one parameter like GN for stock buying decisions. For those who don’t want to read the entire article, it would be suffice to say that GN is based on just 2 of the total 7 criterions suggested by Graham. So, just using this number means that you are missing out on other 5 equally important criterions. We have calculated two values for Graham’s Number. One is named G (Column 8)and takes into account EPS of last twelve months (TTM) alongwith current book value per share. 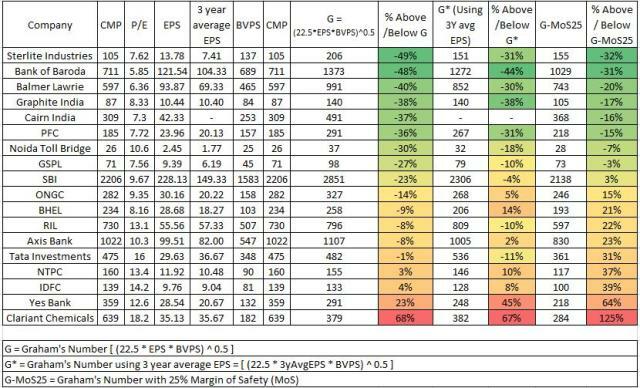 Second is G* (column 10) and takes into account the 3 year average EPS values and current book value. Taking 3 year average smoothens out any extraordinary earnings of one year and helps in arriving at a more normalized EPS value. Though we would have preferred a 5 year average EPS, we could not find sufficient data for all the stocks. Stocks like Sterlite Industries, BOB, Balmer Lawrie, Graphite India are trading almost 40% lower than their respective GNs. Please be reminded that a price below GN is considered to be a sign of undervaluation. But we, being a lot more risk averse, decided to add a margin of safety of 25%. We found that even if we reduce the values of GN by 25% (in column 12), these stocks are still available 25-30% below their GNs. This is a clear sign that any investment made at current levels, may not be a bad idea at all. On the redder end of spectrum is Clariant Chemicals (India) Ltd. Though we ‘love’ this stock for its simplicity, robustness and dividends (obviously), our calculations show that it is trading 65-120% above its GN. Add to this the fact that it is currently available at a PE > 18, it can be safely deduced that shares of Clariant Chemicals are currently overvalued. (Historically, it has an average PE of 15). We also observed that Banks, as a whole, seemed to be trading at levels much below their GNs (including margins of safety conditions!). To see if this was an exception or a trend, we calculated GNs for all major large cap banks. The above table clearly shows that Public Sector Banks are trading at significant (40-50%) discounts to their GNs. Whereas their private sector counterparts are trading much above the GNs. We are not sure about the real reason for the same. (It may be due to PSU tag or higher growth associated with Private banks). Our favorites BOB and SBI (part of DMP) are almost 48% and 23% below their GNs. But be cautioned that this should not be taken as a buy signal. There are a lot many issues like NPAs, etc which need to be looked into, before taking a call of buying into banking stocks. But considering the growth possibilities (here we go again: read forecasting and speculation) that Indian banking sector has; and the role that large cap banks are about / supposed to play, wouldn’t it be an interesting idea to start accumulating units of a thematic (Banking Sector) mutual fund? We think it can be a good idea if one is ready to take the risk of taking a focused bet. Then please subscribe to our feed AND spread the word by liking our page on Facebook. Thanks. Next Entry Do Indian stock markets bounce off PE levels of 12 & 24? Hey can you tell me how do banks calculate their book value? Is it just the assets-liabilities? Or they count it in some different manner which may lead to higher BV? Or knowning a possible estimate of NPA's and discounting the BVPS for the same ,may lead to an accurate GN? If any experienced banker can answer this question, I will be obliged. Dev can you please share the excel sheet you used for this calculation? Do you know any reliable screener that calculates Graham’s Intrinsic value for Indian stocks?